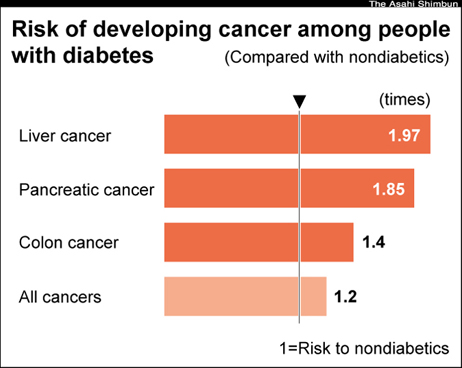 A new medical study from the Japan Diabetes Society and the Japanese Cancer Association has found that people with diabetes run a 20 percent higher risk of contracting cancer. Increased risk for liver cancer was 1.9 times higher, followed by pancreatic cancer at 1.85 times and colon cancer at 1.4 times. Risks for endometrium and bladder cancers also were apt to increase (see figure below) [S]. When there is diabetes in the body, patients develop more insulin which can stimulate cell growth. If this cell growth becomes malignant and uncontrolled, cancers can form. The medical researchers are stressing that healthy lifestyles must be adopted in order to prevent both diabetes and cancer; moderate exercise, healthy, nutritious diet, regular medical check-ups, and controlled use of alcohol, drugs, and tobacco can help decrease chances of these life-threatening conditions.